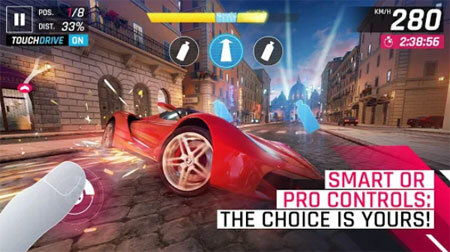 Asphalt 9: Legends is a hyper-realistic arcade racing game developed by Gameloft. It features meticulously detailed real cars, cool HDR techniques, and stunning visual and particle effects that turn every race into a real blockbuster race movie. The game features a top roster of real hypercars for you to drive that is unlike that found in any other game, from renowned car manufacturers like Ferrari, Porsche, Lamborghini and W Motors. You’re free to pick the dream car you need and race across spectacular locations against rival speed machines around the world. Hit the fast track and leave your limits in the dust to become a Legend of the Track. Use the new car editor to define the exact color and material of your car. You can also pick the color of the Rims, and more, to look your best on the track. Charge your nitro to unleash the ultimate Nitro Pulse for the ultimate boost of speed you need to make your car break the sound barrier. Double-tap the brake to do a 360° at any time to take down your multiplayer or AI opponents in style and watch the burnout behind you. Start your street journey in Career mode by completing over 60 seasons and 800 events. And become a real Asphalt racer legend by racing against up to 7 rival players from all over the world in the online multiplayer mode. If you get stuck in the game, check out the video walkthrough and gameplay for the game. This entry was posted in Android Games, iOS Games, Mobile Games, Walkthrough and tagged Asphalt 9: Legends Cheats, Asphalt 9: Legends Game, Asphalt 9: Legends Gameplay, Asphalt 9: Legends Guide, Asphalt 9: Legends Hints, Asphalt 9: Legends Review, Asphalt 9: Legends Solutions, Asphalt 9: Legends Strategy, Asphalt 9: Legends Tips, Asphalt 9: Legends Walkthrough by Marvin. Bookmark the permalink.